My toddler (30 months old) made this picture. She scrunched up some different color tissue squares. 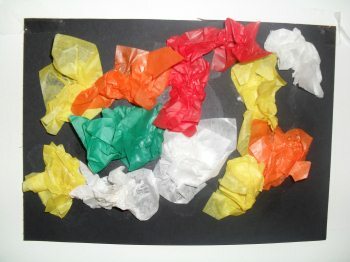 Then stuck them down onto the black paper with kiddy glue. That's it really all I did was lay it all out on the table so she could reach easily. I said use all the colors and she did. I think it turned real good and have put it up on the kitchen wall. Hope you like it too and let your little one try it.